CORRECTION: In a previous version of this article, we stated that the 95 B-Line will have three-door boarding at all stops. Translink has informed The Peak that three-door boarding will only be available at SFU stops. We regret the error. Change is in the air for SFU students. The 135 bus will soon be no more than a distant memory as it’s replaced by a successor: the new 95 B-Line. This deeply contested lifeline between Harbour Centre and SFU Burnaby has been a hot topic for years, having come into question for replacement as far back as 2009. Due to frequent changes and pushbacks, the concept of the B-Line hasn’t come to fruition until now. It will be released on December 19 to coincide with the Millennium Line Evergreen Extension that will service Coquitlam, as the 135 is discontinued. In an email to The Peak, TransLink explained that the 95 B-Line is intended to be a more reliable and direct service, with fewer stops along Hastings Street than the previous 135 bus route. It will also run more frequently, operating every five to eight minutes during peak hours and 12–15 minutes in off times, as stated in TransLink’s 10-Year Vision Public Consultation Summary Report, published earlier this year. According to TransLink, the 135 was the sixth most-crowded bus route in 2015. It has among the least punctual performances in their system as well, due to high congestion on Hastings Street. As a result, it is subject to some of the worst bus bunching in the Lower Mainland, where users cite waiting tirelessly for a delayed bus, only to have two or even three show up at the same time. By moving to limited stops, TransLink hopes that customers will notice significant improvements to reliability and efficiency of the service. While the 95 B-Line hopes to solve a lot of the problems that student face on their commute, there will be questions of concern. “On the 135, I’ve experienced intense verbal assault,” said Shmygol. For many SFU students, the issues that the 135 brings up about inefficiency is an important part of their everyday life. “The thing that bothers me is that it’s labelled an express bus, but as soon as it gets to Burnaby it still stops every block,” said Sarah Duggan, a third-year student who commutes from North Van. While the 95 B-Line will ultimately improve user experience, it also means a loss of stops that are important to accessibility for residents, particularly for elderly residents or those with disabilities. “Walking that extra few blocks might not mean much to a lot of us, but it will to them,” said Duggan. 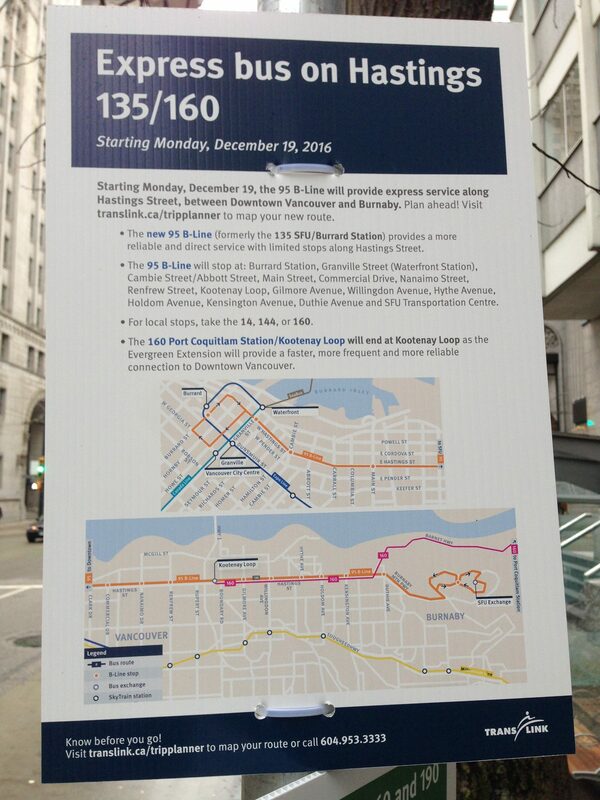 According to TransLink’s notice boards on the 135 route, busses stopping locally after December 19 will be the 14, 144, or 160, which some users have expressed they’re not aware of. However, there are a lot of other busses near that route, especially in East Vancouver where student Grace Lam lives. “There’s the 14 and 16 on Hastings, but there’s also the 4 and 7 primarily on Powell and Dundas. They run parallel to Hastings and are only two blocks down [. . .] Many people don’t know about that,” she said. The new bus will also feature three-door boarding at SFU stops, a trademark of the other B-Lines in the city. This should make boarding more effective, particularly during peak hours at the SFU Burnaby transportation centre. The majority of SFU students have Compass cards, making the feature more feasible. Burrard Station, Granville Street (Waterfront Station), Cambie Street/Abbott Street, Main Street, Commercial Drive, Nanaimo Street, Renfrew Street, Kootenay Loop, Gilmore Avenue, Willingdon Avenue, Hythe Avenue, Holdom Avenue, Kensington Avenue, Duthie Avenue, and SFU Transportation Centre. For this we give up 11 stops in Burnaby!! ?